(Miami, FL) - After a day of feasting with family, friends, and early morning shopping on Black Friday, come to Downtown Miami Lakes to relax and enjoy the opening of the Holiday Season on Main Street. Join The Graham Companies and the Main Street Merchants for the 30th Annual Main Street Festival of Lights, Downtown Miami Lakes, on Saturday, November 29th, from 6:00PM to 10:00PM. 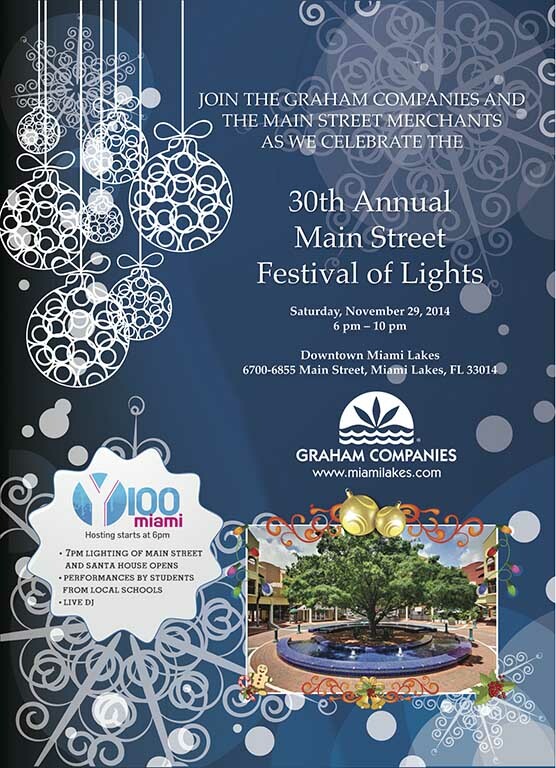 The 30th Annual Main Street Festival of Lights is scheduled to take place along two blocks of Downtown Miami Lakes. There will be family fun for everyone throughout the night such as the Lighting of Main Street, Live DJ, performances by students from local schools and lots of games and prizes, as well as an indoor meet and greet with Santa. The celebration begins at 6PM and will be hosted by Miami’s #1 Hit Music Station, Y100 through 10PM. The Main Street Festival of Lights is Miami Lakes’ best-known holiday tradition and official kick off to the holiday season; it has become a historical, community tradition in South Florida. The Festival of Lights has brought together families from the Town of Miami Lakes and neighboring cities for three decades. Attending the Festival of Lights is also a great way to explore and get to know a little more about Main Street and Downtown Miami Lakes. After celebrating at this free event and enjoying all it has to offer, partake in Small Business Saturday and indulge in the numerous local restaurants, shops and attractions. Main Street has so much to offer, especially during the holiday season. We invite you to come Downtown Miami Lakes to experience this great tradition that builds memories lasting a lifetime.